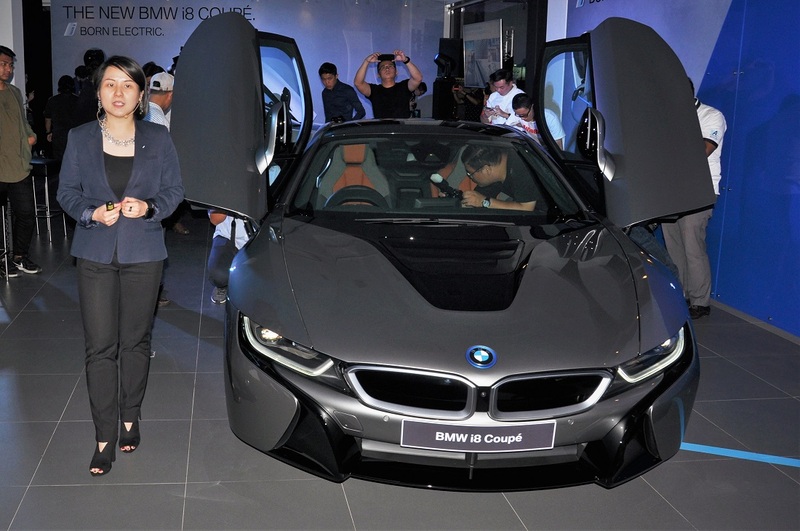 BMW Malaysia has launched the new BMW i8 Coupé, with a retail price of RM1,310,800 (on-the-road before insurance and sales tax in Pen. 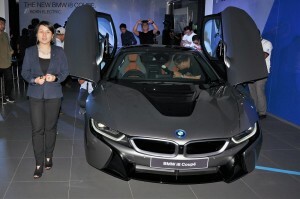 Malaysia). The BMW i8 is a plug-in hybrid using BMW’s 1.5L turbocharged three-cylinder engine at the rear axle and an electric motor on the front axle; this drivetrain has won its fourth consecutive International Engine of the Year Award since 2015. 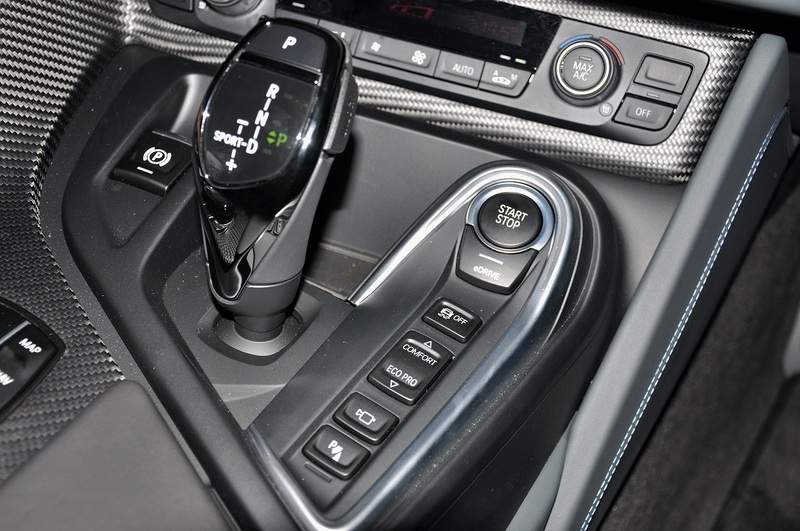 The turbocharged three-cylinder combustion engine has direct injection and VALVETRONIC variable valve timing and produces a maximum output of 231 hp and 320 Nm of torque; the engine is also equipped with a particulate filter as standard that effectively absorbs all the particulate matter contained in the exhaust gases. 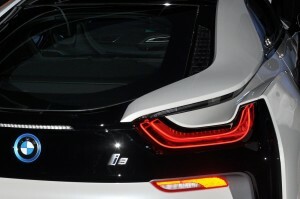 The combined output produced by the electric motor and engine acting in unison has increased to 374 hp. 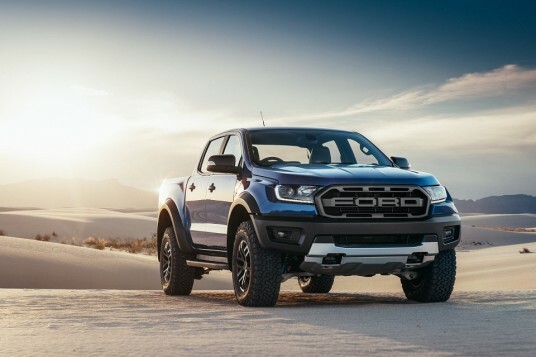 The engine’s power is channeled to the rear wheels through a six-speed Steptronic transmission, while the electric motor drives the front wheels via a two-speed automatic gearbox. 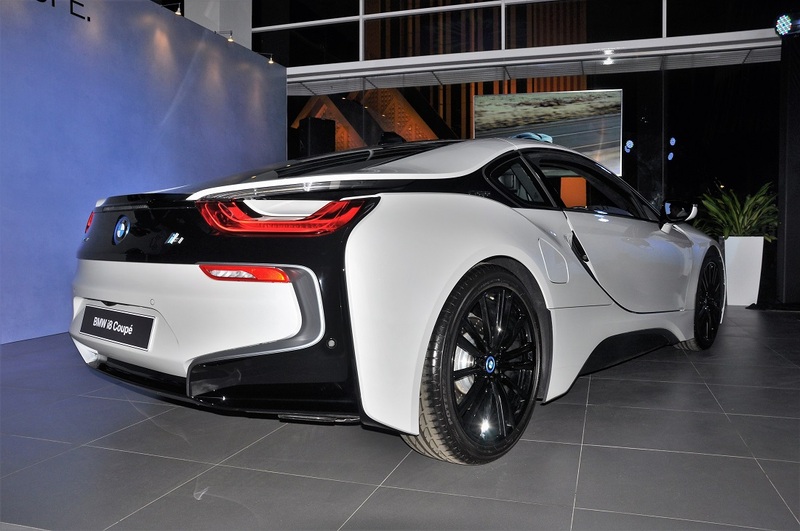 Official 0 – 100 km/h time is 4.4 seconds, while fuel consumption is rated at 1.8 l/100 km, and electric power consumption, 14.0 kWh/100 km. 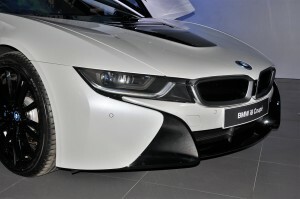 Further, petrol CO2 emissions is 42 g/km. 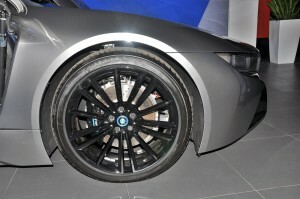 The car runs on 20″ BMW i light-alloy wheels in radial-spoke style and 516 jet black paint. 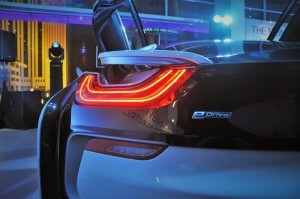 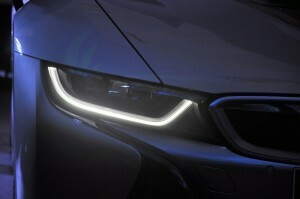 The BMW i8 Coupé is features a brand new LifeDrive vehicle architecture which will represent all future BMW i models. It has a horizontally split structure comprising an aluminium chassis at the bottom and a CFRP (carbon fibre reinforced plastic) passenger cell on top to offer an exceptional degree of design freedom, dynamism and efficiency. 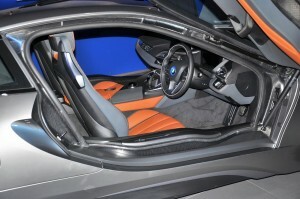 All the suspension and drive components sit within the chassis. 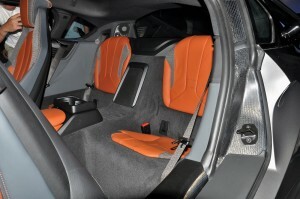 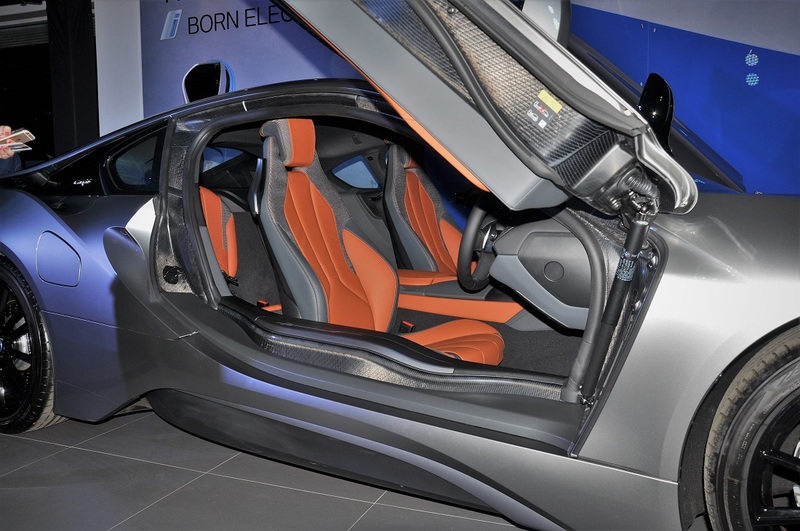 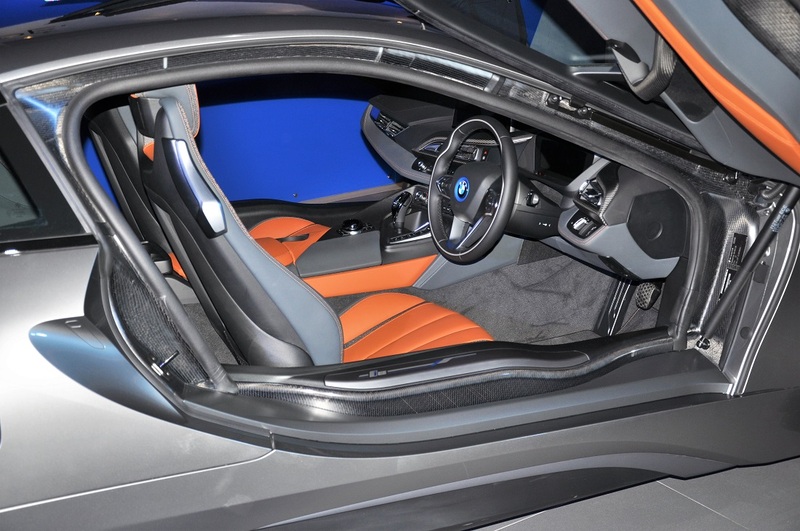 The i8 Coupé is a 2+2-seater designed with a streamlined sports-car look with an emphasis on efficiency – with a flat bonnet, sealed underbody, short overhangs, long wheelbase, large track width and elongated roofline; accentuated by a pair of scissor doors that open forward and upward. 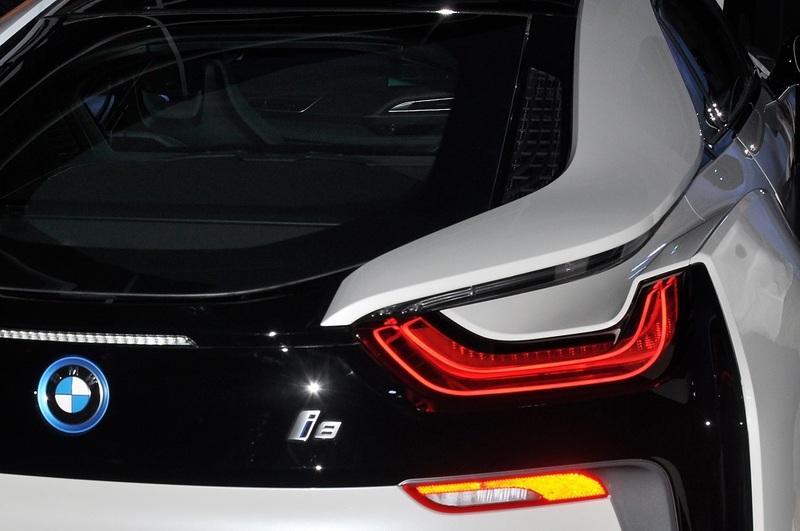 Aerodynamic elements include an air flap control system, air curtains in the front apron, contoured side skirts, “Stream Flow” lines on the car’s flanks, and air ducts between the rear lights and roof frame. The flow of cooling air at the front has now been reroutedto exit at the sides of the car near the wheel arches and into the underbody. 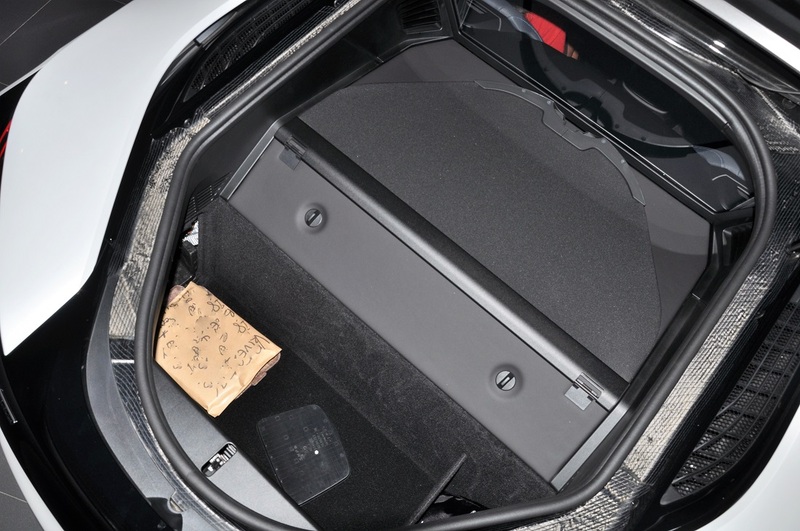 Located centrally in the car’s underbody to effect a low centre of gravity is the high-voltage battery which now has an increased cell capacity of 33 Ah from the previous 20 Ah. 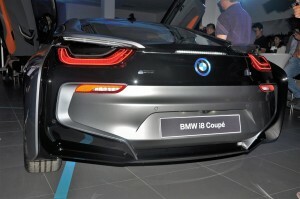 The electric motor output has also increased by 9 kW to 105 kW, and the electric range now extends to 55 kilometres. The number of driving situations where it’s electric power only has been significantly increased. 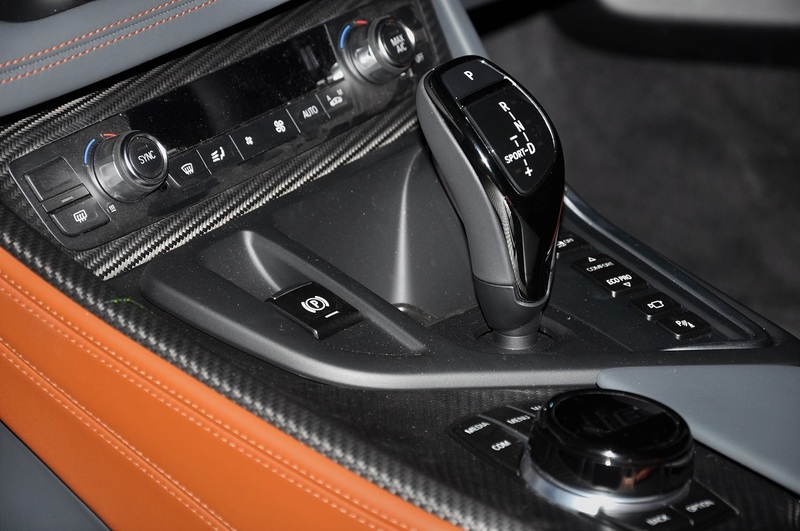 In contrast, the combustion engine is only brought into play when accelerating hard and is switched off again far more frequently with a measured driving style. 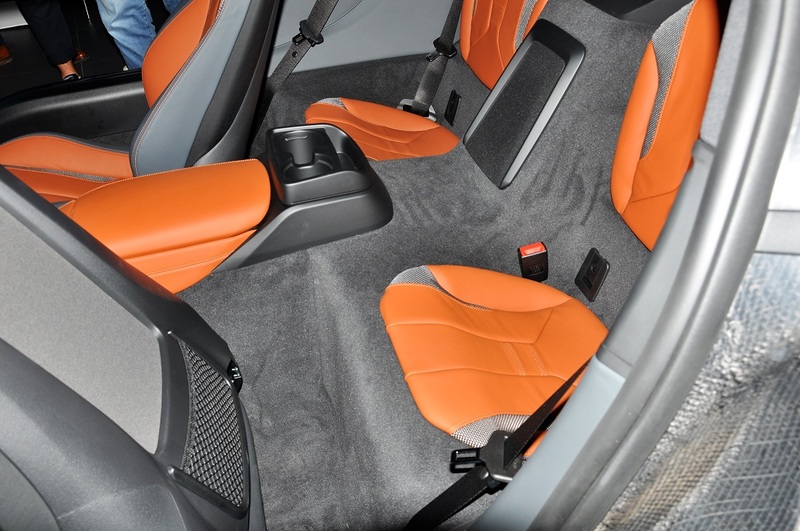 In the electric-only eDrive Mode, acceleration and deceleration can be smoothly executed with the gas pedal only. If the driver takes the foot off the gas pedal, the electric motor assumes the function of a generator that converts the car’s kinetic energy and feeds it back into the high-voltage lithium-ion battery. This process of regenerating brake energy creates braking momentum that effectively slows down the vehicle. In hybrid mode, the electric motor provides a power boost to assist the engine when vigorous acceleration is required. 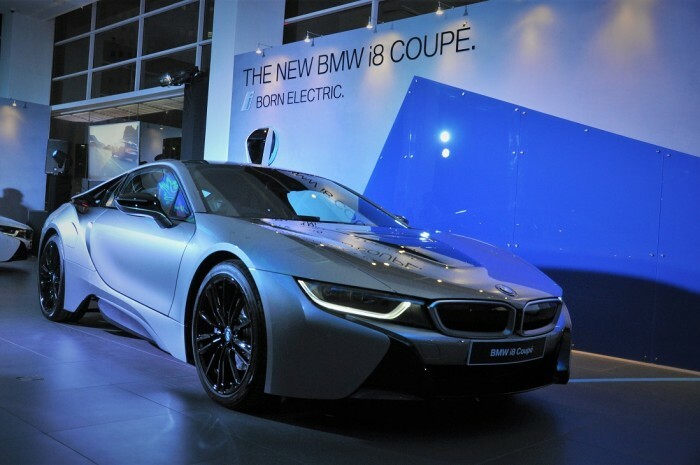 The electric motor is also able to recuperate energy and feed it to the high-voltage battery on the overrun and under braking. 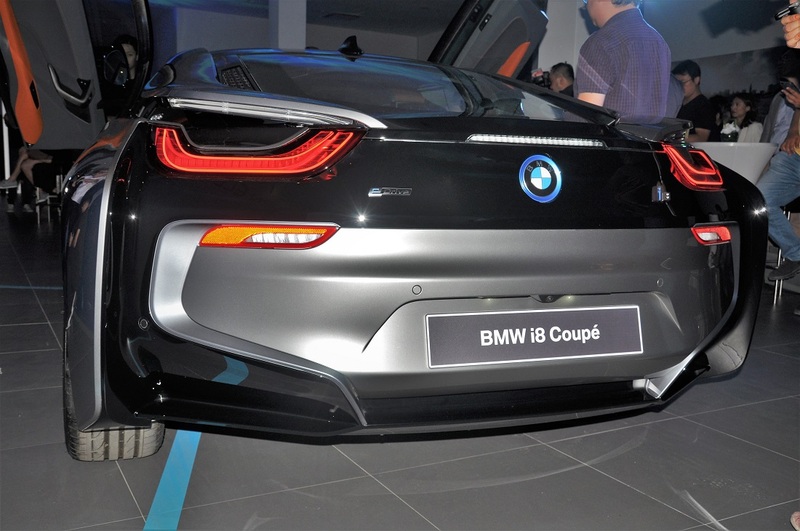 The petrol engine’s high-voltage starter-generator can similarly generate additional reserves of electricity, thereby ensuring that sufficient energy is on tap at all times for the electric drive system in the new BMW i8 Coupé. 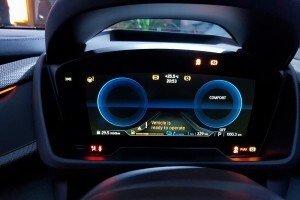 The intelligent energy management is proactive in optimising efficiency. When the navigation system’s route guidance function is activated, the energy management ensures the electric motor is employed as extensively and as wisely as possible for optimal efficiency. 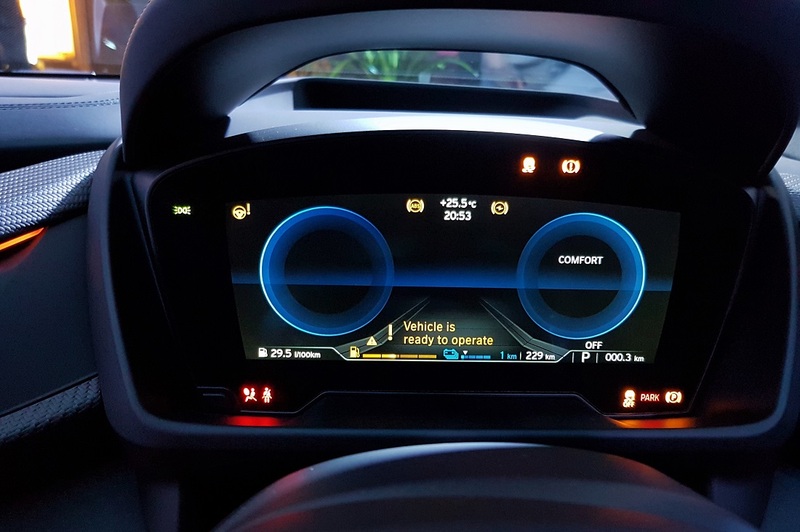 The system analyses the route in full and prompts the powertrain management to run on purely electric power, particularly over low-speed sections of the journey. 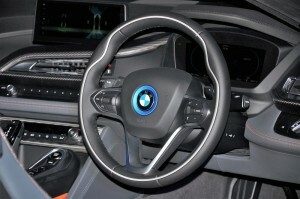 The i8 cockpit is fitted with the BMW Head-up Display that changes to a sports display that includes revs, gears and shift lights when performing manual gear changes in SPORT mode. 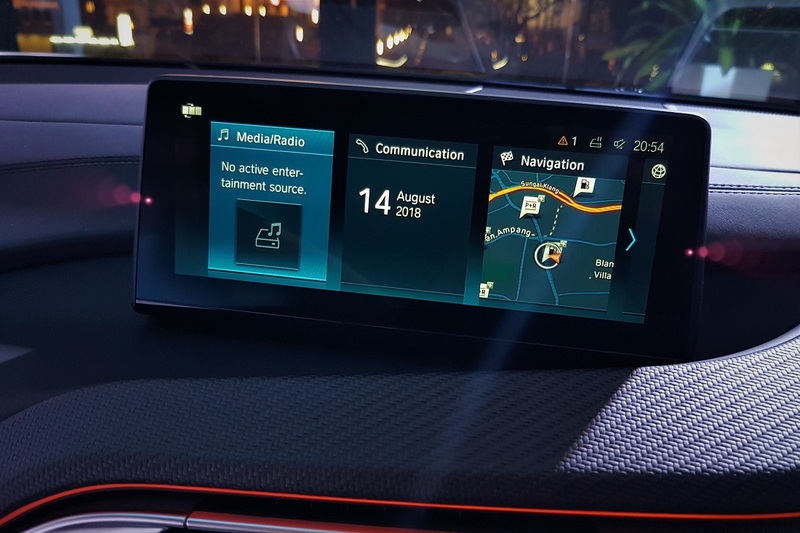 The Navigation System Professional features the most up-to-date user interface, including a modern tile display with live mode. 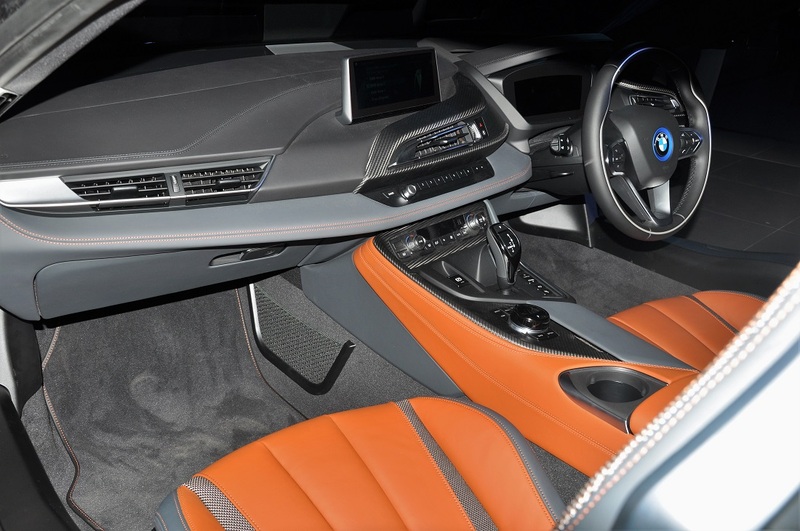 It is controlled using the iDrive operating system, comprising both a Touch Controller on the centre console and an 8.8″ freestanding Control Display screen. The interior is trimmed with open-pored CFRP Carbon trim on the centre console, door handle and dashboard inlay; the iDrive Controller and gear selection lever has a ceramic finish. 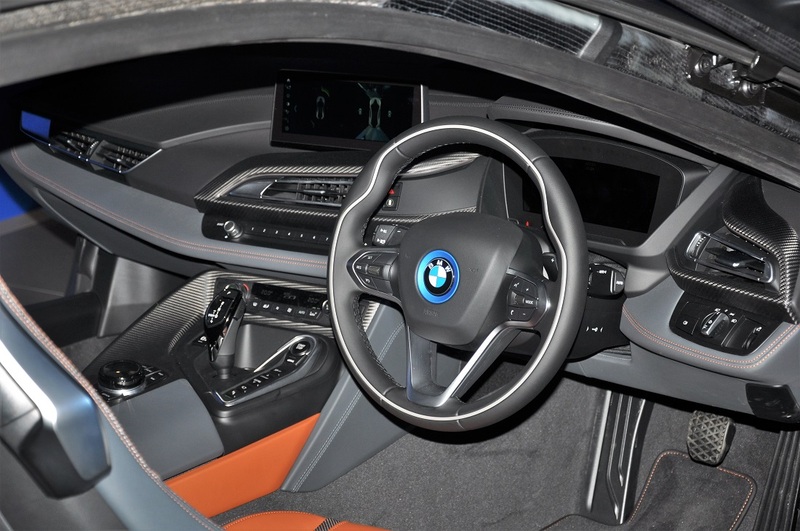 The BMW Connected links the BMW i8 Coupé with its owner’s digital life, aided by the Remote App – which allows them to check and control their vehicles, and to stay extra-efficient even when they are on the go. 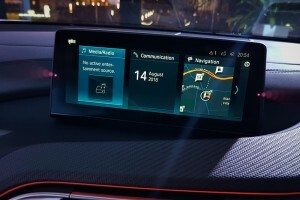 BMW Connected offers a range of conveniences, including showing the current charge status, the range and departure time to ensure the vehicle is charged for the next trip, helping the driver search for charging stations and have the location sent directly to the vehicle for them, as well as access to the efficiency rating of the last trip, tutorials for particularly efficient driving and the CO2 calculator. 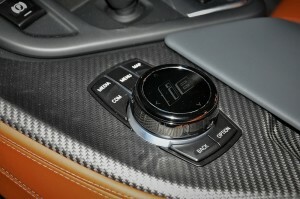 Remote functions such as Remote Door Lock & Unlock, Remote Light Flash and Remote Horn Blow can also be activated. The BMW i8 Coupé’s exterior comes in Crystal White with a Frozen Grey highlight, or the new BMW Individual special paintwork Donington Grey, with the interior in Black Amido or Accaro respectively. 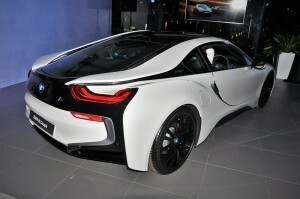 The car is now available at all authorised BMW i dealerships nationwide. 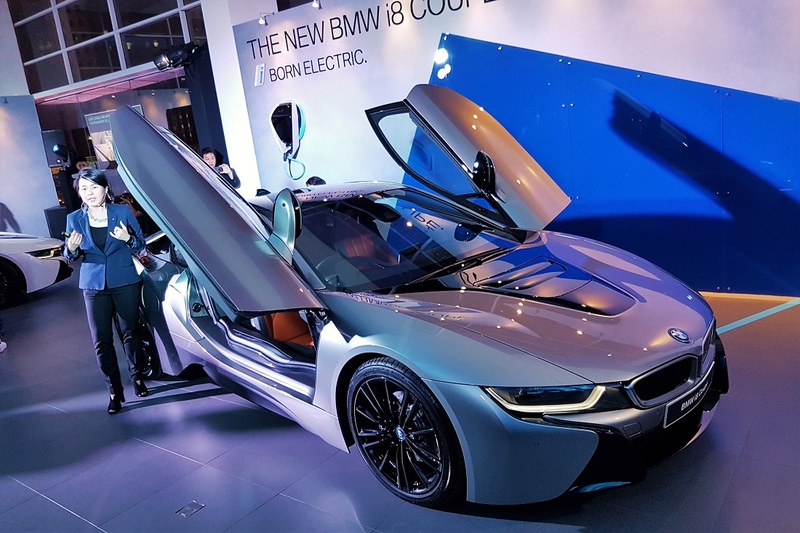 With the Balloon Financing Plan from BMW Group Financial Services Malaysia, you can own the BMW i8 Coupé with monthly instalment plans starting from RM15,088 (based on estimates of an 80% loan on five-year tenure). 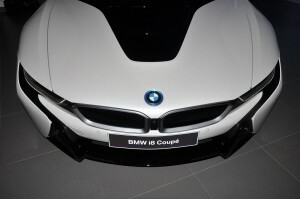 The BMW i8 Coupé comes with a five-year unlimited mileage warranty with free scheduled service programme, two-year tyre warranty programme for run-flat tyre offering and services, BMW Roadside Assistance and Accident Hotline, BMW Group Loyalty+ Mobile App – BMW White Card, and BMW Service Online.